Leviton Decora® 1-Gang standard size screwless decorator wallplate in brown color, has smooth finish and polycarbonate construction for durability. 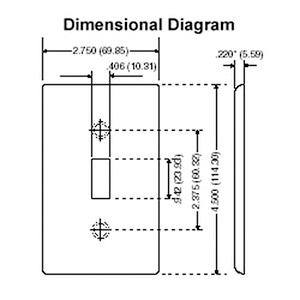 The rectangular wallplate measuring 2.75 Inch x 0.22 Inch x 4.5 Inch, features one decorator configuration. Snap-on mountable decorator wallplate can be mounted in vertical orientation and withstands a temperature ranging from -40 to 120 deg C. It is suitable for commercial, industrial, institutional and residential applications. Decorator wallplate meets UL, ETL, NEMA, WD-1, WD-6, CSA and NOM standards.